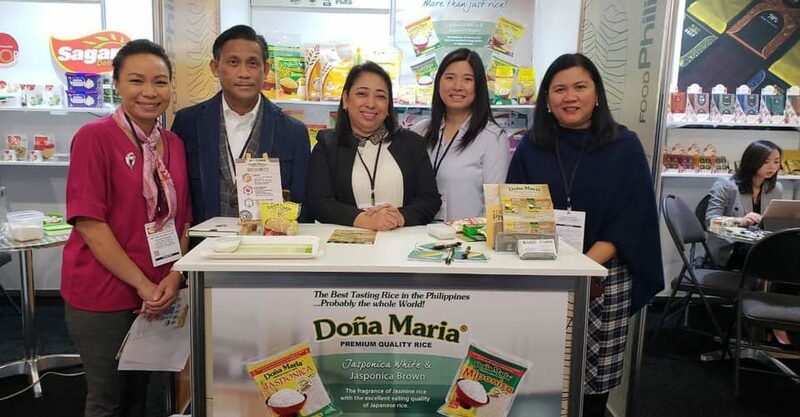 Thirteen Philippine food companies are set to exhibit this week in the 44th Winter Fancy Food Show at the Moscone Convention Center in San Francisco, the United States on Jan. 13 to 15, 2019. Led by the Department of Trade and Industry, through the Center for International Trade Expositions and Missions, the Philippine participation will exhibit and sample the country’s range of healthy, organic and premium food products.“The FoodPhilippines pavilion in San Francisco will have grand a showcase of the Philippines’ specialty food products that are targeted for export in the North American region as well as other neighboring regions,” said DTI-Citem executive director Pauline Suaco-Juan.WFFS is the US West Coast’s largest specialty food and beverage event with an estimated 20,000 annual visitors and 1,500 exhibitors from across the US and 28 other countries. “Specialty food” refers to products of the highest grade, style or quality, derived from their uniqueness, origin, processing method, and design.Exhibiting in WFFS for the first time are CJ Uniworld Corp. with their variety of banana chips; Filipinas Oro de Cacao with their single-origin ‘Auro Chocolate’ from Davao; Grand Asia Integrated Natural Coco Products Corporation with their processed coconut products under ‘Gaincoco’; Innovative Packaging Industry Corp. with their ‘Oh So Healthy!’ fruit crisps.Meanwhile, Philippine companies that are making a comeback in WFFS are Bethany Sales Inc.; Century Pacific Food, Inc./Century Pacific North America; Islamic Da’Wah Council of the Philippines, Inc.; Magicmelt Foods Inc., PasciolcoAgri Ventures; Prime Fruits International Inc.; Profood International Corp.; SL Agritech Corp. and San Miguel Corp..
“Backed with these firms, we are confident that this Philippine delegation will significantly boost the government’s high-impact export strategy to widen our export reach in Western countries,” said Suaco-Juan. According to Almay See, general manager of Innovative Packaging Industry Corp., the US market is a lucrative export market for the Philippines since it “has many Filipinos who are looking for products from their home country.”See also said Americans have been more health-conscious over the years with their fast-paced lifestyle which opens up a big opportunity for their fun and nutritious line of new guilt-free snacking treats made from 100 percent real fruits.For this participation, Innovative Packaging Industry Corp. will be launching two new flavors on their snack line to showcase in WFFS 2019. “We are excited to showcase our two new products in San Francisco along with our three other flavors, namely: Guava Purple Yam Banana, Mango Sweet Potato Banana, Purple Yam Banana Coconut,” said See.As of August 2018, the United States is the Philippines’ second top export destination next to China and followed byHong Kong, Japan and Singapore, according to the Philippine Statistics Authority.In 2017, the Philippines’ total food and agricultural exports to the US hit $1.2 billion, according to the office of the United States Trade Representative. Leading categories include tropical oils ($555 million), processed fruits and vegetables ($199 million), tree nuts ($109 million), raw beet and cane sugar ($105 million) and fruit and vegetable juices ($79 million).This participation under FoodPhilippines is led by DTI-Citem as part of the government’s unified effort to promote the Philippines as a source of quality food products in the global market. development, production and distribution of hybrid rice seed and premium quality rice. © Copyright SL-Agritech. All rights reserved 2017.